A brand new Lake Michigan Credit Union branch is coming to Ada! Near Amway’s World Headquarters, LMCU’s newest branch will be open for business at the corner of Fulton and Ada Drive, on June 3, 2013. 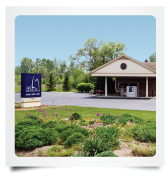 Stop by and make the switch to true community banking at LMCU— the best place for your money!